When I compress a folder or file by right click menu of Mac OS X, the archived file contains .DS_Store and __MACOSX folders. Because I share the archived file online for download, Windows users mistakenly trying to search the file in __MACOSX folder. I need to have a cleaner archive option. I do not want to include .DS_Store and __MACOSX folder, but only the file or folder into the archive file. All I found is CleanArchiver but it is GUI application. It really takes time and I have lots of files to compress. I am looking for a solution by context menu if possible. 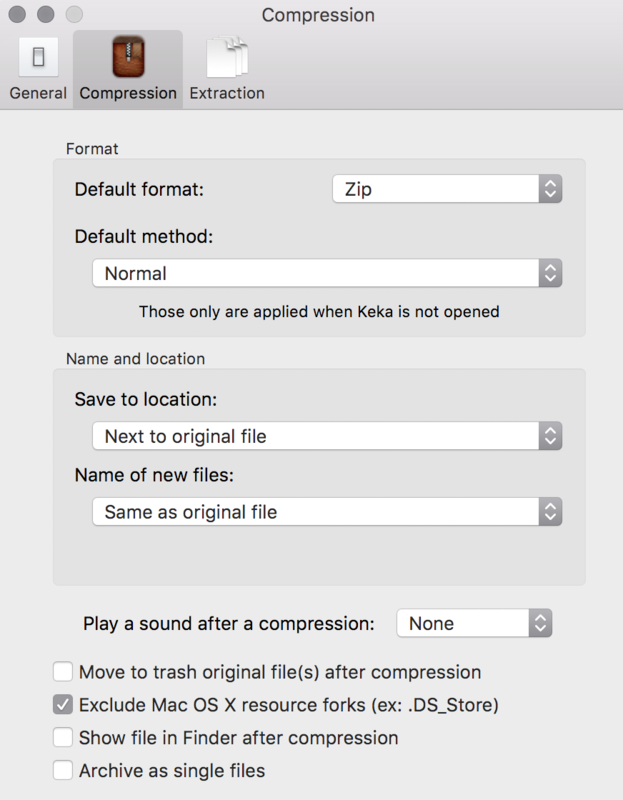 Is there any solution that you can recommend for clean compressing? You can use zip command in Terminal to zip the files without the .DS_Store, __MACOSX and other . * files. Paste this zip -r dir.zip . -x ". *" -x "__MACOSX"
Example: Let's say you have a folder on your desktop called Folder with stuff to zip. zip -r dir.zip . -x ". *" -x "__MACOSX"
Now you have a file called dir.zip without __MACOSX and . * files in the folder Folder on your desktop. My understanding is that __MACOSX is a subdirectory artificially created by the Mac GUI tools to hold meta data such as extended attributes that can't be normally saved in a zip file. If you use the Mac GUI tools to unpack the zip file, then the tools will know what to do with __MACOSX and the directory won't actually get unpacked. The problems happen when you send your .zip file to Windows or Linux users, or just use the general-purpose unzip program to unpack them. Those tools won't know that __MACOSX is special, and will just unpack it. Finally, the accepted answer is the best because if for some reason __MACOSX actually does exist in your directory (e.g. because you previously used unzip to create it), the -x option will keep it from being packed up. It is a GUI app, but has Applescript & Services support, with which you can run presets with your default settings - including omitting Mac-specific files like .DS_Store & __MACOSX. Possibly worth a look. BetterZip supports two services: one for extracting and one for creating archives. You can configure what the BetterZip services will do with presets. To use a service, select one or more files or folders in the Finder and choose Compress with BetterZip or Extract with BetterZip from the Finder > Services menu or the Services submenu in the contextual menu. You can even set keyboard shortcuts for the BetterZip services, e.g., ^⌥⌘C for compressing and ^⌥⌘E for extracting. 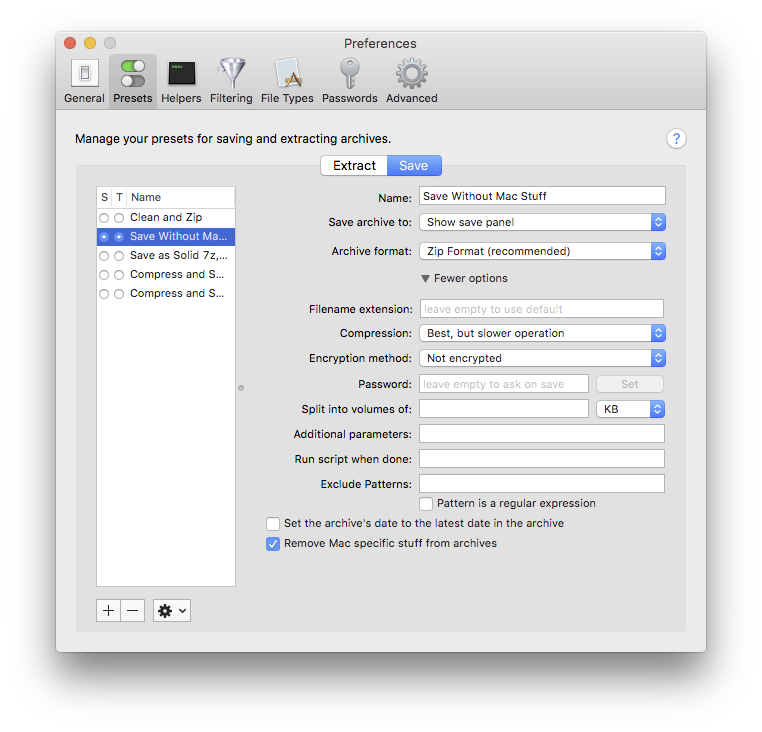 To set shortcuts for services, go to System Preferences > Keyboard > Keyboard Shortcuts and choose Services in the left table. In the right table, scroll to Files and Folders, choose Compress with BetterZip and press ↩. An editable textfield will appear. Press the desired shortcut. Not the answer you're looking for? Browse other questions tagged macos folders archive .